We have gathered to honour men and women from this country and abroad who have demonstrated exceptional service to humanity. The national orders are the highest honour that our country bestows on citizens and foreign nationals. We confer the Order of Mendi, the Order of Ikhamanga, the Order of the Baobab, the Order of Luthuli, the Order of Mapungubwe and the Order of the Companions of OR Tambo to distinguished persons who have demonstrated that it takes ordinary men and women to make our country and the world a better place. The ceremony takes place just after Freedom Day, on which South Africans closed the chapter on institutionalised racism and repression, and began a journey towards a united, non-racial, non-sexist, democratic and prosperous South Africa. The recipients of the National Orders have each contributed in some way to the attainment of this goal. We reiterate that South Africa is a much better place to live in now than it was before 1994. We thank all South Africans as well as our friends from all over Africa and the world, for their contribution to making our country the success that it has been since 1994. The Order of Mendi is awarded to any South African who has performed extraordinary acts of bravery anywhere in the world, who put their lives in danger or ultimately lost it in trying to save the lives of others. Today we confer the Order in silver to ten stalwarts of the liberation struggle and freedom fighters. Among these are included four members of the legendary 1967 Luthuli Detachment, Messrs Hermanus Loots of Hertzog in the Eastern Cape, Ulysses Modise from Kimberley, Joseph Nduli of Mayakhulu in KwaZulu-Natal, all posthumously. It is also awarded to Mr Ndaliso Ngcayiya from the erstwhile Prospect Township for his contribution to the struggle for liberation. The Luthuli Detachment, named after ANC President-General Chief Albert Luthuli, was a joint operation by the ANC guerrillas and the Zimbabwean African People’s Union (Zapu) dispatched on 31 July 1967 to infiltrate South Africa from Zambia through Rhodesia (Now Zimbabwe). The award in the same category also goes posthumously to Mr Maqashu Leonard Mdingi, an ANC, SA Communist Party and South African Congress of Trade Unions and Umkhonto we Sizwe (MK) operative who was one of the leaders of the heroic Pondo Revolt. The Order also goes to Dr Sizakele Sigxashe posthumously, a freedom fighter who was also an academic and an economist as well as a renowned ANC intelligence officer. He is awarded for his selfless contribution to the liberation struggle, serving the movement exceptionally well in various places such as Tanzania and Angola, and in the public service as the first Director-General of the National Intelligence Agency at the dawn of freedom. Major General Peter Lesego Tshikare receives the Order posthumously for his distinguished service to the freedom struggle, serving the ANC in Tanzania, Zambia, Egypt and in Angola, and also as an intelligence operative, responsible for South Africa, Botswana, Swaziland and Lesotho. He served as Major General in military intelligence in the South African National Defence Force until January 1998. A brave and committed freedom fighter and soldier, General Jacqueline “Jackie” Sedibe of White River, Mpumalanga, also receives this award. She joined the ANC at age 17 and was one of the earliest female recruits to UMkhonto Wesizwe. She served the nation exceptionally well during the struggle and also in the South African National Defence Force in the democratic era. Mr Peter Sello Motau, an MK operative who worked closely with Joe Slovo in the Regional Military Committee (RMC) responsible for the Mozambique and Swaziland front into South Africa is also honoured, posthumously. Mr Motau and his comrade Mr Cassius Maake, were tragically assassinated in Swaziland in an ambush by South African agents. Mr Sam Ntuli paid with his life after working tirelessly to promote peace in Thokoza in the East Rand. Horrific state sponsored violence raged in our communities during the 1980s and 1990s. He receives this award posthumously for his commitment to peace and courage in the face of extreme danger. The Order of Ikhamanga is conferred to South African citizens who have excelled in arts, culture, literature, music, journalism and sports. We confer it in gold posthumously to Dr Benedict Wallet Vilakazi, known commonly as BW Vilakazi, one of the pioneers and early contributors to IsiZulu literature and the preservation of isiZulu culture. He wrote enlightening novels, among them the seminal Nje Nempela as well as poetry anthologies, thus inspiring subsequent generation of writers. Ms Laurika Rauch receives the Ikhamanga for devoutly using her music to speak out against the wrongs of apartheid. A prolific and award winning Xitsonga musician, Mr Thomas Hasani Chauke receives the Ikhamanga for his pioneering role in the development of Xitsonga music. Ms Sylvia “Magogo” Glasser receives the Order for her role of teaching dance to black and white learners together in her home in Johannesburg during the difficult apartheid years which enforced separation, and for fundraising for their career development. Dr Marguerite Poland receives this Order for excellent contribution to the field of indigenous languages, literature and anthropology, including isiZulu Folklore, with five novels to her name. The Order of the Baobab is awarded to South African citizens for distinguished service in the fields of business, the economy, science, medicine and for technological innovation and community service. We award the Order of the Baobab to Professor Rosina Phakeng, the Vice-Principal for Research and Innovation at the University of South Africa. She receives the award for her excellent contribution in the field of science and for putting South Africa on a global map through her outstanding research work. The Order of the Baobab also goes to Prof Helen Rees, the Founder and Executive Director of the Reproductive Health and HIV Institute of the University of Witwatersrand. She receives the order for championing public health care, especially child and maternal health and for her outstanding contribution to the fight against HIV and AIDS. The Order of the Baobab is also awarded posthumously to the highly regarded pioneer in business and community leader, Ms Marina Nompinti Maponya. She joined her husband, Mr Richard Maponya, to establish a strong business empire and proved that black people were capable of running successful businesses, in the face of apartheid repression. We confer the Order of Luthuli to South Africans who have made a meaningful contribution in any of the following areas - the struggle for freedom, democracy, human rights, nation-building, justice, peace and conflict resolution. We bestow to the late Mr Suliman Saloojee of the Eastern Transvaal, currently Mpumalanga, and a member of the renowned Transvaal Indian Congress. He was one of the key participants in the Defiance Campaign of 1952, and was killed tragically by apartheid forces in 1964. The devout human rights and anti-apartheid activist in the Cape Peninsula, Mr Brian Francis Bishop receives the Order of Luthuli posthumously in silver for fighting apartheid tyranny through human rights activism and opposition to Group Areas Act’s forced removals. A theologian, academic and anti-apartheid activist and member of the United Democratic Front, the Rev Dr Simon Gqubule, receives the Order as well for his contribution to the struggle for freedom and the promotion of human rights. The award also goes to a struggle veteran who served a long prison term in Robben Island, many years of service in exile and in underground operations in the country, Mr Mac Maharaj. 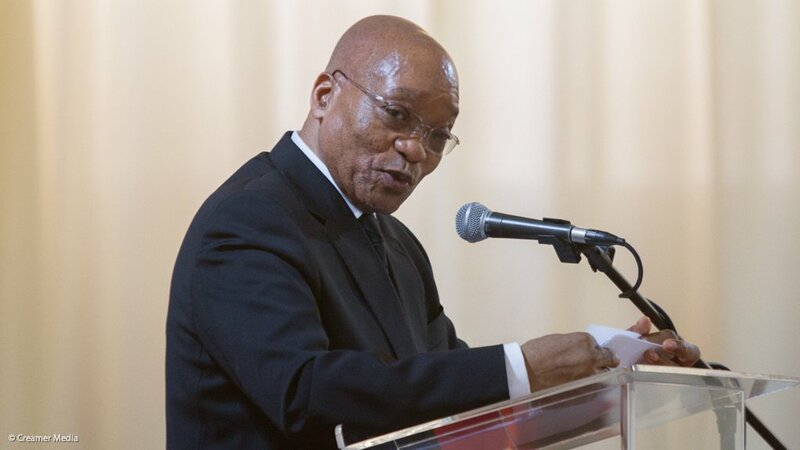 He has also served in the post-apartheid government as Minister and also as presidential advisor in the fourth and fifth administrations, until his retirement in 2015. The Order is also conferred on a courageous woman who became a symbol of the struggle against apartheid, Ms Winnie Madikizela-Mandela. Ms Mandela endured periods of prison detention and banning orders by the apartheid government from 1958 and through subsequent years. This included a nine year banishment period in Brandfort, in the Free State. She was not deterred by the persecution. She became a formidable force facing the enemy head on, in the pursuit of freedom. Our people salute her. She is currently unwell and we wish her a speedy recovery. The Order of Luthuli also goes to Ms Mary Thipe from Matatiele, the former vice-chairperson of the ANC Women's League who worked tirelessly to advance the struggle for freedom during the 1950s. She participated in various campaigns, including taking part in the famous potato boycotts in Bethal, Mpumalanga. Ms Amy Rietstein Thornton of Cape Town receives the Order for her devotion to the struggle against apartheid. This freedom fighter joined the South African Communist Party in the 1940s, served the ANC from the 1950s and served in the Support Committee for the Treason Trial in 1956, and was later active as a member of the United Democratic Front. Accomplished trade unionist, Mr John Zikhali receives the Order of Luthuli posthumously for his role in improving the conditions of workers as President of the Southern African Clothing and Textile Workers Union, including his role in fighting the importation of cheap goods which threatened the jobs of textile workers. The Order of Luthuli is awarded in gold posthumously to Mr Msizi Harrison Dube. Based in Lamontville in Durban, he engaged in various community struggles. He fought the introduction of the Bantu education curriculum in schools, for equal pay for equal work and against rent increases, using his famous slogan, Asinamali, (we have no money). Mr Dube also became a leading force against the forced removal of black people by the Durban City Council from Cato Manor to KwaMashu, as well as against the advisory boards established by the apartheid government to control black townships, until his assassination in 1983. Mr Cleopas Madoda Nsibande receives the Order of Luthuli in gold posthumously for his exceptional contribution to the struggle as an ANC activist from the 1940s and a prominent trade unionist who was very vocal about better wages for the workers. He was a founding member of the South African Congress of Trade Unions and was also one of the key campaigners tasked to canvass views on the Freedom Charter countrywide. Mr Nsibande was also one of the 1956 Treason Trialists. The Order Mapungubwe is awarded to South African citizens for the achievements that have made an impact internationally and who have served the interests of the Republic of South Africa well. We confer this award in gold posthumously to an exceptional journalist and struggle veteran, Mr Zwelakhe Sisulu, who used his craft to voice unrelenting protest against apartheid, and exposed the evils of the system. In the process he endured long periods of detention without trial in the mid-1980s. The Order of the Companions of OR Tambo is awarded to foreign dignitaries who actively promoted the freedom, justice, human rights and democracy, through active support and expression of solidarity for the struggle against apartheid colonialism. We award the Order of the Companions of OR Tambo in silver to Mr Noureddine Djoudi, a Political Commissar in the Algerian National Liberation Army, who helped former President Mandela in 1962 when he had left the country secretly to seek support for our armed struggle. This encounter heralded the warm relations between the Algerian government and the ANC, and now between the two governments and peoples. Ms Maria Petronella Adriana Kint, receives the Order for actively supporting the anti-apartheid movement in the Netherlands over many years, and for her role in the underground Operation Vula activities in Johannesburg until 1994. At the dawn of freedom she shifted focus to arts and culture, promoting relations between the Netherlands and South Africa. We have great pleasure to also award the Order of the Companions of OR Tambo to my dear colleague, Her Excellency President Michelle Bachelet Jeria, the President of the Republic of Chile. The President receives the award in gold for her exceptional contribution to the fight for democracy and freedom in her country and globally. She has sent a special message apologising for her inability to accept this award in person, due to matters of state. By the power vested in me in terms of Section 84 of the Constitution of the Republic of South Africa, I now confer the Order of Mendi, the Order of Ikhamanga, the Order of the Baobab, the Order of Luthuli, the Order of Mapungubwe and the Order of the Companions of OR Tambo to the distinguished persons indicated. They shall henceforth be honoured as esteemed Members of the Orders.